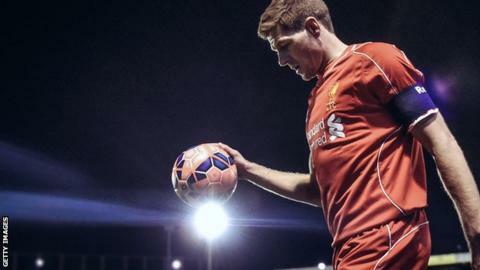 Liverpool captain Steven Gerrard is on the brink of finalising an 18-month deal to join Los Angeles Galaxy. The 34-year-old will sign a contract worth about £6m across the full term of the deal, making him one of the highest earners in Major League Soccer. An announcement is expected this week following Friday's shock news that Gerrard will quit Liverpool at the end of the season. He will be available to join the Galaxy once his Reds contract expires in June. David Beckham famously spent five years at the LA club until 2012, while Gerrard's ex-Liverpool team-mate Robbie Keane currently plays for the Galaxy. While MLS has a salary cap structure, each club has three designated player places, which they can use to sign star players. The retirement of 32-year-old Galaxy captain Landon Donovan, MLS's all-time top scorer, has paved the way for Gerrard to join the league as one of its top earners. Gerrard's deal is worth around £4m a year - or about £76,000 per week. The 2015 MLS season runs from March through to October. The full fixtures list will be announced on Wednesday. He joins former England midfield partner Frank Lampard in swapping the Premier League for the US. Lampard, 36, will join New York City in the summer after his short-term deal at Manchester City was extended until the end of the season. Former LA Galaxy player Alexi Lalas told BBC Radio 5 live that Gerrard will be "an ambassador" for the MLS on and off the field. "There's no way around the fact that he's a legend, but when he gets here he has got to perform for a team that is already very, very good," Lalas said. "That is ultimately what he will be judged on, just the way David Beckham was." Gerrard has scored nine times in all competitions this season, including both of his side's goals in Monday night's FA Cup third-round win at AFC Wimbledon. Liverpool have come in for some criticism since news of his impending departure broke, with former team-mate Jamie Carragher among those who believe they should have done more to keep him.